The cool weather in May, along with much needed rain, has helped drought conditions but hasn't been good for outdoor activities. It was another gloomy start this morning after a chilly and raw final Tuesday in May. But there’s hope for your Wednesday. Temperatures today will warm closer to 70 inland and into the 60s at the coast. Clouds will hang tough, but they’ll eventually break for a bit of sunshine, especially inland. The lack of sunshine is getting on many people’s nerves as it seems like we just can’t string together a nice stretch of weather. But while this year’s May will end up cooler than average, it’s not even in the top half of cool Mays in the record books. In other words, it’s just a typically cool spring. It has been the coolest May since 2005 and that is making it seem much cooler than the average year. I’ll soon have more data on meteorological spring, which ends at midnight. But, suffice it to say, the season was likely typical in terms of wetness and coolness. 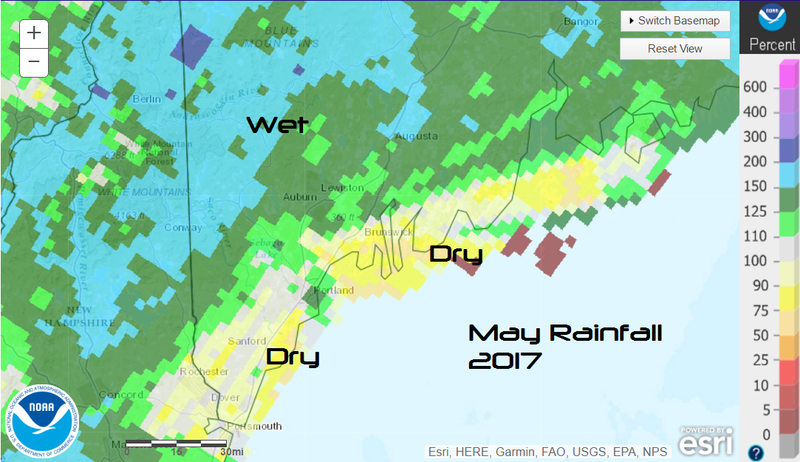 Some areas have seen much more wet weather than average conditions during the past three months, but that has not been the case around coastal Maine. Some areas of the coast actually need rain, as hard as that is to believe. This afternoon some cold air up at around 18,000 feet will pass overhead. As this happens, the relatively warm air at the ground rises, and when it reaches the cold air, it can create clouds and showers. 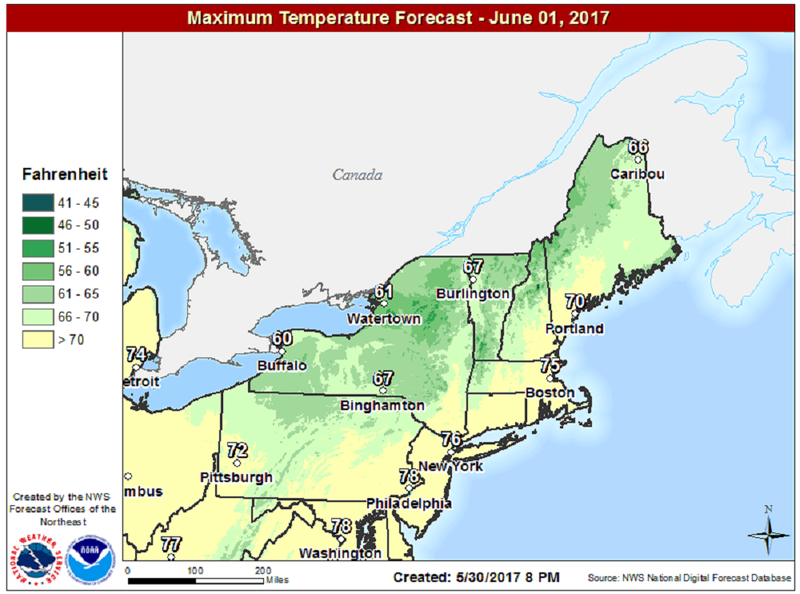 The chances of rain are not very high but there could be some thunder over western New England. Any thunderstorms that form there would die out by the time they got to the coastline. On Thursday a westerly flow takes over and pushes the marine layer out to sea. 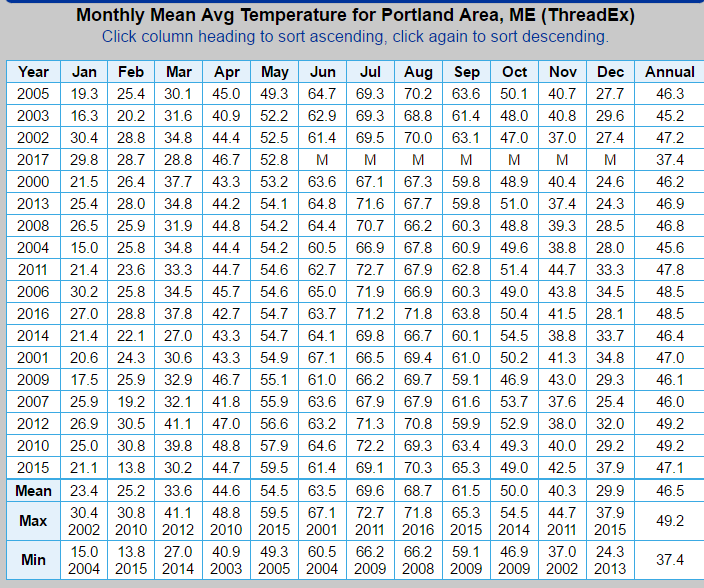 This means places like Wells, Portland and even Rockland will exceed 70 degrees. It may feel hot to some of you after the cool stretch. The weekend looks good to start, but clouds and showers are back in the forecast later Sunday and early next week. There will be another coastal storm or even a series of them passing south of New England. This definitely keeps it cool around here with highs in the 60s at best, but the rain chances are still not written in stone. If the storms pass far enough south, most will stay dry, but the pattern isn’t quite done with us yet.